The Sun powers our solar system, so could it power all our Earthly needs, too? And if it someday could, where would all those solar panels go? According to a graduate thesis by Technical University of Braunschweig student Nadine May, the number of solar panels needed to supply the entire world's energy needs would fill just 25,000 square miles – or an area only slightly larger than the state of West Virginia. So larger countries would have to host more panels – maybe even on a per-capita basis. 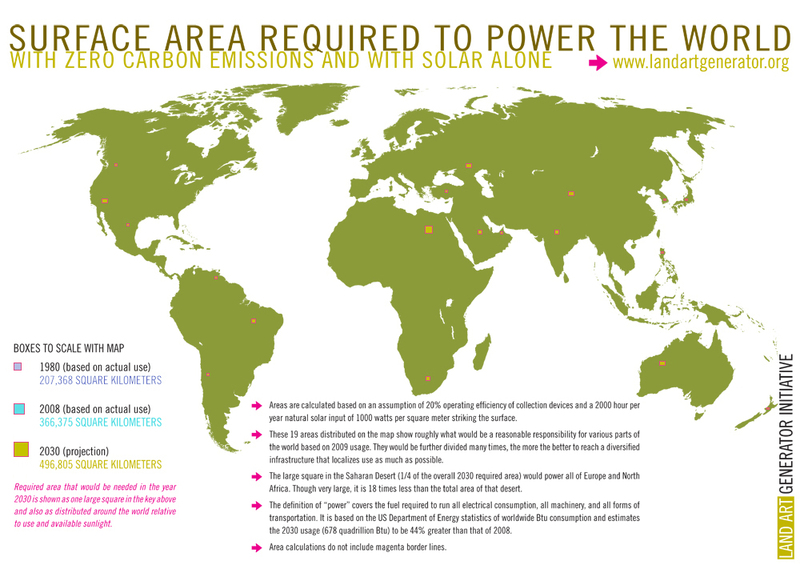 This graphic is a good projection of a possible disbursement of panels worldwide for energy demands in the year 2030. The graphic places about a quarter of all panels in the baking hot Saharan Desert. Why not just put all of the panels in the sunny Sahara or someplace similar? A few reasons. The more evenly distributed the panels are, the better; localization would help diversify infrastructure, reduce the inevitable power losses that occur over long transmission distances, and allow more countries to share the burdens of installation and maintenance. There's also the argument against centralizing our main energy source, which is where the world is currently with oil. According to this article, out of the current top 10 leading oil-producing countries, at least two are in current conflict and the political situation in five of the others is considered "unstable." Throughout history, the desire for commodities – oil, metals, food, etc. – has been a frequent cause of wars. So while it's interesting to imagine the land space needed to build enough solar panels to power the world, it's even better to imagine every country achieving, or at least approaching, energy autonomy thanks to a renewable source like solar power. While sunny countries would have an advantage, northern hemisphere countries like Germany are proving that solar power is just as viable. Even with only about 65 days of sunlight per year, Germany has been called the world's "unlikely leader in solar power." This past June, Germany got more than half of its total energy from solar power. Solar power generation is up by 34 percent this year. But while there's a lot of good news about the potential of solar energy to scale up, the reality is that the technology to enable the creation of a worldwide solar energy grid isn't here yet. Current solar panels can only capture 20 percent of the Sun's energy, and to become a viable, wide-scale source of energy for the world, they would need to capture much more than that. Our power needs aren't going anywhere, though, and neither is the Sun. So it's an idea whose time may yet come.